The Pakistani Taliban has named a native from the Himalayan region of Gilgit-Baltistan as its new spokesperson. Khalid Balti, a resident of Gilgit-Baltistan, has been chosen as the new spokesperson of Pakistan’s Taliban (TTP). He was selected to replace Shahidullah Shahid, who left to join the Pakistan based affiliates of the Islamic State in Iraq and Levant (ISIS). Naming a local is evidence of the Taliban’s growing interest in the strategically located Gilgit-Baltistan region. Khalid Balti, who identifies himself as Mohammad Al-Khorasani, was born in Thogmus Village in the Gangche district in Gilgit-Baltistan. He left for Karachi in 1994 after studying at a local religious school, though his wife and four children continue to live in Baltistan. Balti is considered a religious scholar whose previous affiliations with several madrassas in Karachi include Jamiat-ul-Rasheed, Jamia Banoria, and Jamia Farooqia. His expertise in publishing and association with the Taliban’s Umer media led to his prominence and his appointment is a diplomatic move by the Taliban to use cultural competency to fortify their stronghold in a disputed region that is claimed by both India and Pakistan. Moving forward, it is expected that his understanding of local sectarian dynamics between Shia, Sunni, and Sufi Nurbakhshia will serve in recruitment efforts. Defense and political analysts who are familiar with Gilgit-Baltistan’s connections with Afghan and Kashmir Jihad are not surprised by the Taliban’s attempt to put this region on the international terror map. Given the geopolitical dynamics and Gilgit-Baltistan’s shared borders with China’s Xinjiang Province, Tajikistan, Afghanistan, and the Indian region of Ladakh, it was not a matter of if it was going to happen but how soon. In the last two years, the Taliban has been involved in sporadic attacks in Gilgit-Baltistan, killing dozens, including local minorities, military officials, and tourists. The group has also attacked and bombed local girls’ schools to show its opposition to female education. Like the Taliban, ISIS also stands to gain in Gilgit-Baltistan, a potential point of convergence between affiliated militant groups from Central Asia, Afghanistan, Xinjiang, Kashmir, and Pakistan. 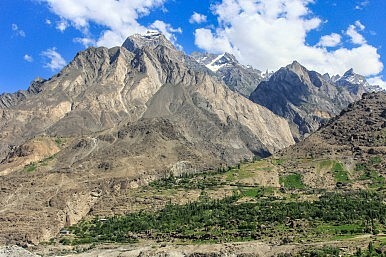 The rugged mountainous terrain and sparse population of Gilgit-Baltistan is conducive to the staging of militant forays into India, which the plains of Punjab lack. Control over Gilgit-Baltistan also allows critical access to the minerals and precious gems of the region as well as trans-Asian trade between Pakistan, China, and Central Asia. This access to financing and leverage represents a game changer in the Taliban and ISIS’s mission to establish viable states. The Taliban and ISIS stand to benefit from an existing terror infrastructure and residual local sympathy for the Kashmiri and Afghan mujahideen. Despite opposition from local Shias, Pakistan employed religious extremism as a tactic to counter Indian control in Kashmir which led to militants from across the nation rushing in to establish training camps and seminaries in Gilgit-Baltistan. They further mushroomed during the Afghan-Soviet War when China-funded Uighur fighters and Afghans used Gilgit-Baltistan as a staging ground. Ideology, loyalty to the Pakistani military and poverty persuaded many local youth to participate, creating a critical mass. This historical context is important in understanding why ISIS, in order to grow its influence in South Asia, is interested in establishing relationships with Pakistani terrorist organizations such as the Taliban and Lashkar-e-Jhangvi and political organizations such as Ahl-e-Sunnat Wal Jamaat (ASWJ) and Jamat-e-Islami. These organizations, as well as the Ikhwanul Muslimoon (Muslim Brotherhood), share the ideology of Maududi, Hasan al-Bana, and Syed Qutub that is best summarized by Jamat-e-Islami’s statement, “It is very necessary to welcome the announcement of the establishment of Islamic caliphate by the ISIS because Islamic caliphate is the aspiration of every Muslim and there has never been a disagreement on the issue among the Muslims in any period of history.” This statement is an indication of widespread political support for ISIS in South Asia. The recent reconciliation between Al-Qaeda and ISIS in the Middle East will further consolidate their South Asian affiliates. According to an official report, ISIS’s recently formed 10-member strategic planning committee is negotiating with local militant organizations including Mullah Omar’s loyalists. The report also warns of plans to target military installations, government buildings, and the Shia community – and there is a strong indication that a Taliban-ISIS crescent of control is emerging with its epicenter in Northern Pakistan. As Lashkar-e-Jhangvi and ASWJ have a strong presence in Gilgit-Baltistan, their potential collaboration with ISIS is a concern for the region where the majority Shias are their prime target. Collaboration between the Taliban and ISIS in establishing a stronghold in the Northern Areas of Pakistan and Gilgit-Baltistan is a concern not only for locals but for the political stability and growth throughout the entire region. Given increased linkages occurring among terror networks, so too must India, China, Pakistan, and Afghanistan set aside chronic territorial disputes and engage in greater collaboration based on common interests and threats. How Can Islamabad Further Isolate the Pakistani Taliban? Pakistan has a chance to isolate the militant group if the country decides to completely support the Afghan peace process. The Islamic State's Support Base in Pakistan Continues to GrowTrump’s Afghanistan Plan: Old Wine in a New BottleWill US Sanctions on Hizbul Mujahideen Make Pakistan Reconsider Its ‘Good Taliban’?What's Driving Russia-Pakistan Cooperation on Afghanistan?Would India Support a Post-ISIS Independence Push by the Kurds? What Are China’s Plans for its Airborne Corps? What the reshuffling of top leadership tells us about the future development of PLA aviation. Sihanoukville: A Cambodian City Losing Its ‘Cambodian-ness’Why is China Developing a New J-11 Variant?Afghanistan: Prospects and Challenges to Regional ConnectivityIsrael Balancing US-China Relations: Geostrategic ContextIs Vietnam Creeping Into a Succession Crisis?